DeConcini McDonald Yetwin & Lacy, P.C. is pleased to announce attorney Alexia Peterson has been elected to the Maricopa County Bar Association Young Lawyers Division Board of Directors. The Young Lawyers Division is committed to assisting new lawyers who have been in practice for five years or less and/or who are 36 years of age or younger, develop their profession and foster leadership and community stewardship. 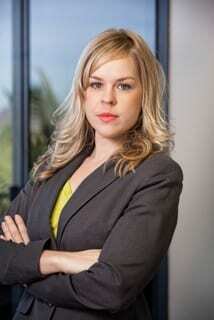 Attorney Peterson is an associate in the DMYL Phoenix office. She is currently serving as the President Elect for the Young Lawyers Division of the State Bar and also serves on the Arizona State Bar Communications Committee. Her practice emphasizes Estates Planning, Elder Law, and Family Law.